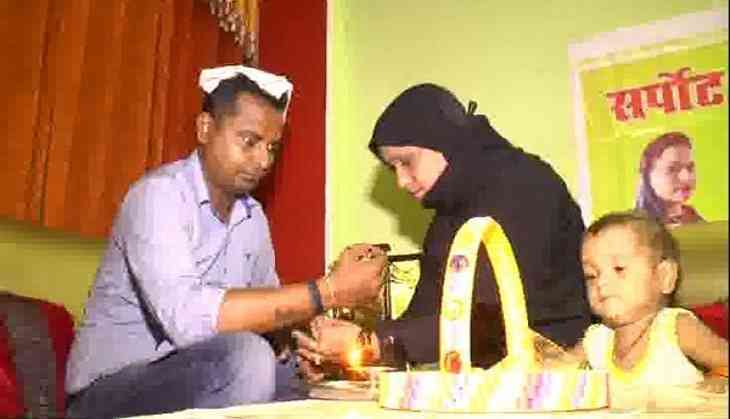 Setting an example of harmony and brotherhood, the women of a Muslim family in Naubasta area of Uttar Pradesh's Kanpur tie rakhi to their Hindu brothers every year. Keeping up with the tradition of Ganga-Jamuni tehzeeb, every year on Raksha Bandhan these women get dressed, decorate their 'puja thali' and perform the rituals. "We have been tying rakhi on the wrists of our Hindu brothers for many years now, and it makes us very happy," said Shabia Khan. Ganga-Jamuni tehzeeb is an Urdu term for the culture of central plains of Northern India, especially in the Doab region of Ganga and Yamuna rivers; it has a fusion of Hindu and Muslim elements. Allahabad, Lucknow, Kanpur, Varanasi are few of the many centres of this culture. Earlier in the day, President Ram Nath Kovind also expressed the desire of strengthening the feeling of brotherhood amongst the people while extending his wishes to the nation on the occasion.